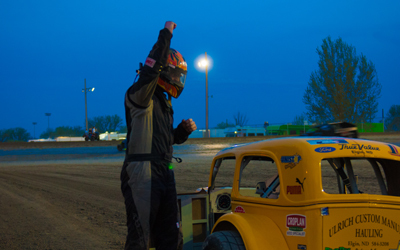 Spring finally arrived at the Dacotah Speedway, Friday May 23rd. It was the perfect night for racing as a 10 lap IMCA Sport Compact feature started the night before intermission. When the green flag waved, Nic West grabbed the lead quickly from pole sitter Chase Schlafmann. West started to dista nce himself from the field while Schlafmann lost positions to Kody Stoxen and Josh Roehrich. Stoxen and points leader Roehrich battled for second and at the same time, started to close in on leader West. As the laps wound down, it was a three car battle for the win between West, Stoxen and Roehrich. Coming out of turn four and to the checkered flag, West held off Stoxen and Roehrich for his second career win at the Dacotah Speedway. Nylee Dimeo and Alex Thompson rounded out the top five. Chris Welk and Donald Robinson blew by polesitter Bradly Steffes in the first IMCA Modified concy. Only the top four from the ten lap concy would transfer to the feature. Welk and Robinson raced side by side for the lead but a lap two caution would regroup the field. Robinson quickly pulled away as Drew Christianson flew from fifth to second place on the restart. Welk and Steffes raced for third place but Welk got too high in turn four and dropped to fourth with four laps to go. Welk hung on to fourth place over Travis Olheiser. Pole sitter Bradly Steffes finished third behind Christianson and concy winner Donald Robinson. 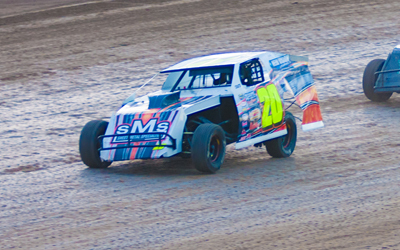 Bismarck's Tim Perkins grabbed the lead in the second IMCA Modified concy. Pole sitter Eric Fetzer faded early, losing positions to Jerad Thelen, Brian Swenson and Brent Schlafmann. A caution on lap four erased Perkins's lead and on the restart, Swenson quickly passed Thelen for second. Swenson challenged Perkins's for lead and they raced side by side for position. Swenson would prevail, taking the lead before a caution with four laps to go. On the restart, Swenson pulled away and drove on to win the concy. Perkins finished a distant second ahead of Thelen and Brad Hanson. 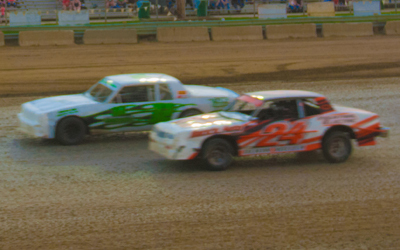 In the Hobby Stock feature, Ben Meuchel and Aaron Aaseth raced side by side for the lead. Aaseth powered by Meuchel to lead lap one. Meuchel lost second place to Derek Voller before a caution reset the field. On the restart, Jeremy Engelhardt made it a three car battle for the lead between Aaseth, Voller and himself. Voller shuffled into the lead on lap six but Aaseth rallied back, retaking the lead a lap later. The three drivers continued to battle for the lead until Aaseth got loose in turn four and spun out with four laps remaining. Leaders Voller and Engelhardt continued to race for the win on the restart as Meuchel lurked in third. On the final lap, coming to the Open Road Honda finish line Meuchel was spun from behind by Aaseth. Aaseth was charged for the last lap wreck and Meuchel retained a third place finish. 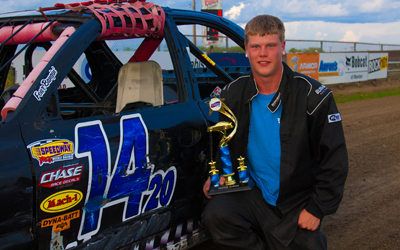 Points leader Brent Vetter finished fourth and Wyatt Rath-Wald finished fifth. Jeremy Engelhardt led the final two laps to win back-to-back feature victories over Derek Voller. It was a three car battle for the lead in the WISSOTA Street Stock feature between Shawn Becker, David Falkenstein and Zach Frederick. Frederick, who started fifth, would shuffle into the lead and Matt Dosch would follow. 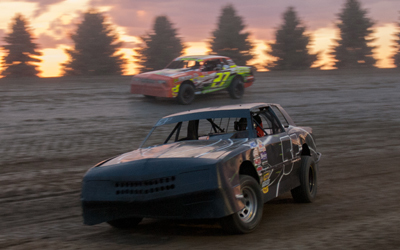 Dosch used the high line around Dacotah Speedway to grab the lead from Frederick on lap nine while Frederick tried to hold off Eric Paul for second. A series of quick cautions slowed the pace but on the restart with seven laps to go, Paul took the lead, bringing Frederick with him. Dosch, who dropped to third, started showing signs of engine problems as a trail of white smoke escaped from under his car. Paul and Frederick battled for the win, racing side by side with five laps to go. Frederick retook the lead with four laps to go and drove on to win his first feature of the season over Eric Paul. Rookie Scott Gartner finished third as Eric Harpole beat Matt Dosch to the line to finish fourth. Glen Ullin's Adam Meuchel started on the pole for the INEX Legends feature. Meuchel lead the first three laps before Bismarck's Drew Papke powered into the lead on lap four. Meuchel rallied back to retake the lead but he couldn't hang on to the lead. Papke and Steven Kuntz would slip by Meuchel with eight laps to go. Papke and Kuntz raced side by side for the lead. 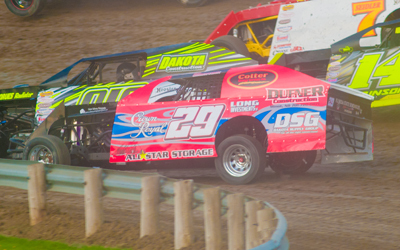 Papke's high line gave him the advantage over Kuntz in turn two but Kuntz's low line gave him the edge in turn four. A caution with three laps remaining regrouped the field and on the restart, it was a three car battle for the win between Papke, Kuntz and Troy Hoff. Kuntz dove low under Papke coming out of turn four and just narrowly edged Papke to the finish line to win his first feature victory of the season. Hoff finished third while Tom Wagner and Donavin Wiest rounded out the top five. The IMCA Modified feature ended the night with Eric Burwick and Kirk Wojahn on the front row. Burwick quickly pulled away at the start while Wojahn lost second place to Minot's Robert Hellebust. Hellebust reeled in leader Burwick and was all over his rear bumper. As Burwick and Hellebust raced for the lead, Wojahn had his hands full in third, holding off Tracy Domagala, Shawn Strand and Mark Dahl. Strand got too high in turn four which allowed Dahl, Marlyn Seidler and Jeremy Keller to slip by on lap 10. Seidler and Keller charged to the front, picking off Dahl for fifth, Domagala for fourth and Wojahn for third. Late race cautions worked to Seidler and Keller's advantage as they stormed to the front with six laps to go. Burwick, Seidler and Keller raced three wide for the lead however, it was Keller's highline that prevailed. Keller led the final four laps to win his second feature of the season over Marlyn Seidler. Burwick, who lead the first 20 laps finished third while Shawn Strand came back to finish fourth ahead of Spencer Wilson. 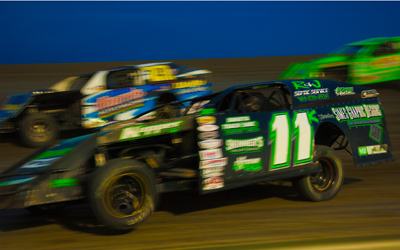 Dacotah Speedway is a high-banked three-eighths-mile clay oval located at 2500 Longspur Trail, just south of Memorial Highway, Mandan, ND.